around long before studies into the Islamic economy began to be conducted. Driven mostly by Muslim women, the growth in the overall Muslim population, and their burgeoning purchasing power, the halal fashion industry has been undergoing momentous growth. In fact, Muslim consumer spending on clothing was estimated to have reached $243 billion in 2015 – this accounts for 11 percent of the global market spend, and constitutes a growth of 5.7 percent from the previous year. Of that sum, approximately $44 billion were spent on modest halal clothing that same year. The sector’s momentum is far from dying out; to the contrary, spend on modest fashion is projected to reach $368 billion by 2021, buoyed not only by the efforts of up-and-coming Muslim designers, but also by some of the world’s biggest names in the fashion industry who have ventured head-on into the sector. What is more, Qatar’s Mayhoola investment fund has gone as far as buying French luxury label Balmain. Dolce & Gabbana, for one, kicked off 2016 by launching its first-ever collection of hijabs and abayas for the Middle East market. Meanwhile, Burberry launched its first Ramadan collection, and Uniqlo its second modest fashion range. Other international brands have approached the sector from a more social and philanthropic angle; for example, H&M signed on a hijab-wearing model, Mariah Idrissi, in a commercial that encourages the retailer’s customers to recycle their clothes. 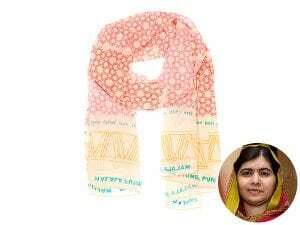 Moreover, education activist Malala Yousafzai collaborated with US-based Toms to create the Malala Fund x Toms Scarf, where 100 percent of the profits from sales will be donated to support girls’ education. The global fashion sector has not been spared the effects of the rapid technological transformation of the “fourth industrial revolution”. The entire industry, which once – and still to a great extent – relies on its classic aspect and established heritage, has been pushing forward to adapt to the set-to-be-ubiquitous Internet of Things. Fashion brands the world over have been hard at work to strike a balance between the “wearable technology” trend, and the style and elegance that forms their very core. And halal fashion is no exception; Muslim designers have been successfully incorporating innovations into the age-old designs they seek to preserve. To name but a few, Dubai-based designer Manaal Al Hamaadi recently created the first solar-powered abaya that can charge a portable electronic device on the go. Meanwhile, a crowdfunding campaign is underway to fund an ambitious project to design a climate-adapting hijab. All of this makes it abundantly evident that the sector is growing at a healthy pace and is ripe for investment. The notion is evidently not lost on major brands and investors who have heeded the call and are now financing one halal fashion venture after the other.